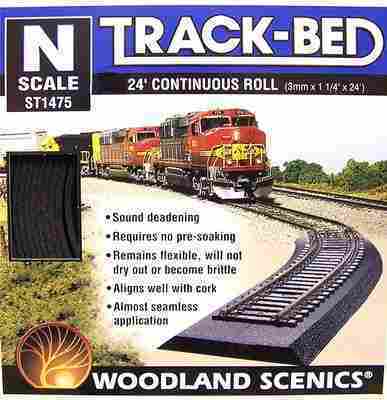 Recommended price £9.75 A 24foot length of foam trackbed for 'N' gauge track. 3mm thick 1¼" wide. This trackbed has the chamfered edge already aplied. Can be secured using PVA glue or double sided tape. Hold in place with Foam nails ST1432 until the glue dries. A sprinkle of ballast and it's done.